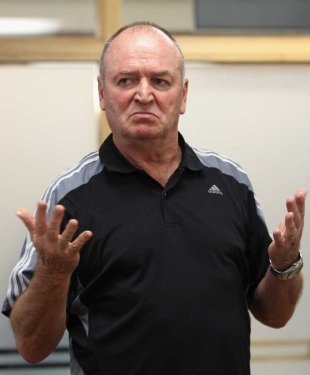 All Blacks head coach Graham Henry has refused to confirm that he will retire following this year's Rugby World Cup. The 65-year-old former Wales and British & Irish Lions boss, who has been in the role since 2003, is widely expected to step down later this year - with current assistant Steve Hansen seen as the most likely replacement - but Henry has hinted he may not be ready for retirement. "No, not in my humble opinion," he told stuff.co.nz. "But I'm sure in other people's it's very big. What I have made a decision on is to be totally focussed on the Rugby World Cup and then in November to give some thought to the future. One thing is, I'm not too old, I'm just late middle-aged. They have just given me the pension now," he joked. Henry has also called for consistency over the refereeing of the breakdown at this year's World Cup. He hoped the differing interpretations between northern and southern hemispheres would not become an issue with his concerns stemming from a belief that European officials allowed the defending side a greater contest at the tackle than their southern counterparts - citing the performance of referees in this year's Super Rugby competition. "They lost that focus for a wee while in the middle of the competition, perhaps they're getting it back now," he said. "So they are different and we just need consistency over the 10 [World Cup referees]. If they all referee the same way, then we as coaches and players can do the business better." Henry also expressed concerns about the scrum and specifically the issue of tight-head props boring in at the set-piece. Henry argued that if the front rows had their heads above their hips and pushed square, there wouldn't be a issue. "As soon as you allow that tight-head to bore in, we've got a problem," Henry said. "Often the loose-head prop is getting penalised when it's not his fault, which irritates me." The 30-man All Blacks squad for this year's Tri-Nations will be named on July 10 and will almost certainly be the group of players tasked with winning the World Cup barring injury or suspension. "It'll [the first All Blacks squad] be pretty close to it, I think in the ideal world it should be the same [as the World Cup squad]," Henry told ONE News.